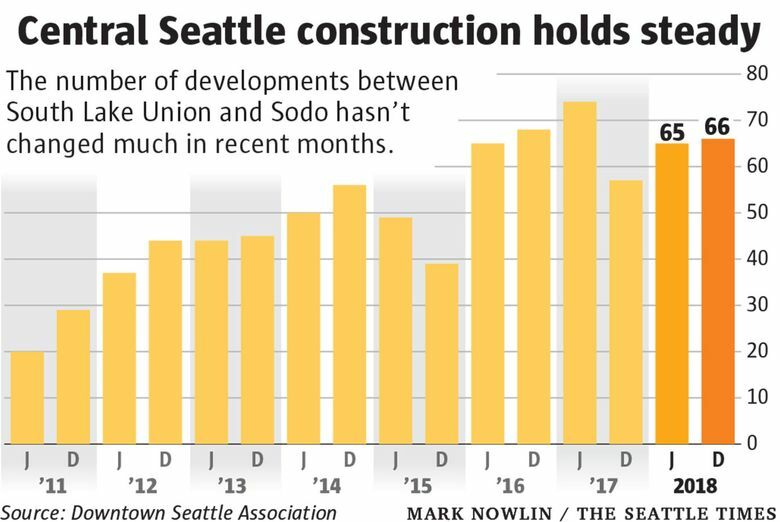 South Lake Union, Lower Queen Anne and First Hill have 10 projects apiece underway, as the local construction boom continues. 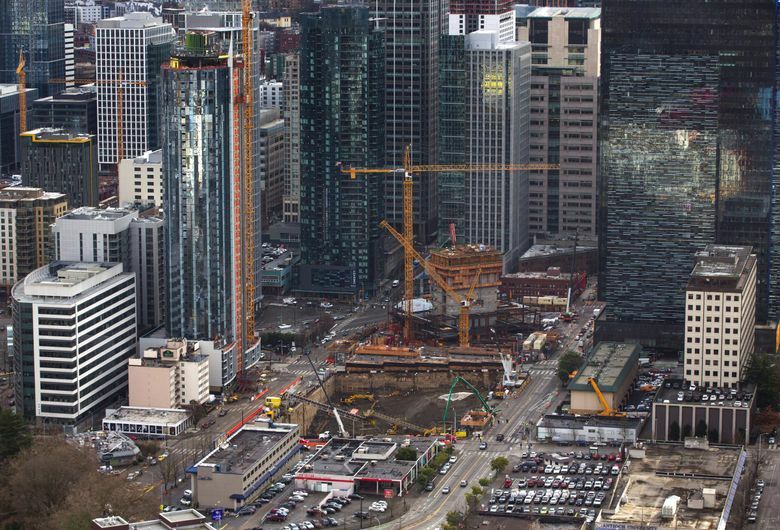 Even several years into Seattle’s record development boom, the building just won’t stop. And there’s no clear sign that it will slow down anytime soon. There are 66 major projects underway now in the central part of the city, from South Lake Union to Sodo, up from 65 six months prior, according to a twice-yearly report released Tuesday by the Downtown Seattle Association. Construction peaked at 74 projects a year and a half ago, and has had some ebbs and flows over the years, but the general trend throughout the decade has been more and more and more building. For context, Amazon’s entire campus in Seattle has about 44 buildings. What’s more, using permit plans, the group counted 32 new projects ready to get started soon, and another 129 in the pipeline for future years, figures that haven’t changed much. Really the only thing that may stop the frenzy is the growing shortage of developable sites left — parking lots and low-slung buildings are disappearing, and two-thirds of developable land in the city is reserved only for single-family houses. The construction boom is especially noteworthy because most of the new projects are apartments, and the bevy of new housing opening up in the city in recent years has resulted in a slowing rental market — but developers seem undeterred. When including new buildings now in lease-up, about 1 in 10 apartments in the city are sitting empty, while Seattle rents over the past year have grown at about the same rate as inflation. New buildings, in particular, have had trouble filling up: It’s become commonplace for new apartments to offer a month or two in free rent to lure in tenants for a lease. The added supply has been massive: Nearly one-half of all apartments in central Seattle were built this decade, according to the Downtown Seattle Association. Nevertheless, more than two-thirds of the buildings under construction right now are residential, and the vast majority of those are apartments. Greater downtown had a record 5,700 new housing units open in 2017, and while that dipped to 3,800 last year, current projects under construction should yield 3,500 units this year and 5,600 in 2020. Another 23,000 units beyond that are waiting in the pipeline, though not all will get built. This decade, Seattle has built as much housing in the central part of the city as San Francisco has built citywide, the report notes. One shift that continues: Developers are tiptoeing back into the condo market for the first time since before the housing crash a decade ago, switching some project plans from for-rent apartments to for-sale condos. The central part of the city has 1,000 condo units getting built now, with 2,300 in the pipeline. Office construction actually took a big hit last year — just a half million square feet opened, essentially equivalent to one skyscraper and one-fifth the amount that opened in each of the previous few years. But that’s a function of timing for the many buildings underway; a record 4.5 million square feet of office is set to open in 2019, led by Amazon’s growing campus and new expansions for Facebook and Google. Another new trend: 2,100 new hotel rooms opened last year, more than in the rest of the decade combined. That was largely the result of the new 1,260-room Hyatt Regency Seattle opening in the Denny Triangle, as the biggest hotel in the Pacific Northwest. A few other hotels are under construction now, as well. Overall, the biggest project underway now is the first phase of the new Expedia campus, valued at $600 million, according to permit costs (which typically understate the full, actual cost of a project), followed by the $570 million Rainier Square office and housing development. Other big ones include the $390 million 2+U office project and the $350 million Colman Dock upgrades. South Lake Union has been the epicenter for construction, but Lower Queen Anne and First Hill now have just as many projects — all three neighborhoods have 10 underway now. The Denny Triangle has seven developments and Capitol Hill has six. Mike Rosenberg: 206-464-2266 or mrosenberg@seattletimes.com; on Twitter: @ByRosenberg.